This winter was unusually cold in many parts of the US, and sustained cold weather can drastically reduce the moisture content of the air. The nylon 6/6 material used to manufacture standard cable ties is hydroscopic, meaning that it both absorbs and releases moisture. Ties that are designed properly and produced with 100% virgin (not recycled/reground) material, rarely exhibit breakage due to dryness. 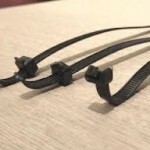 However, cable ties manufactured with less material in the housing itself or where the housing joins the band can dry out, become brittle and break in those areas of the tie. Also, cable ties that are manufactured with lower quality, reground material can dry out faster than those produced with virgin resin. Reground material can also contain impurities/contaminants that structurally weaken the tie. The easiest solution is to use KSI Cable Ties manufactured out of 100% virgin material – we ensure that our ties do not minimize the amount of material in the housing and pawl area. Ties should also ideally be stored in their original plastic bag prior to being used and not left out in the open. 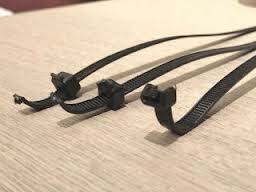 This entry was posted in Cable Tie Blog, Product Blog on April 24, 2014 by KSIGrp.com.